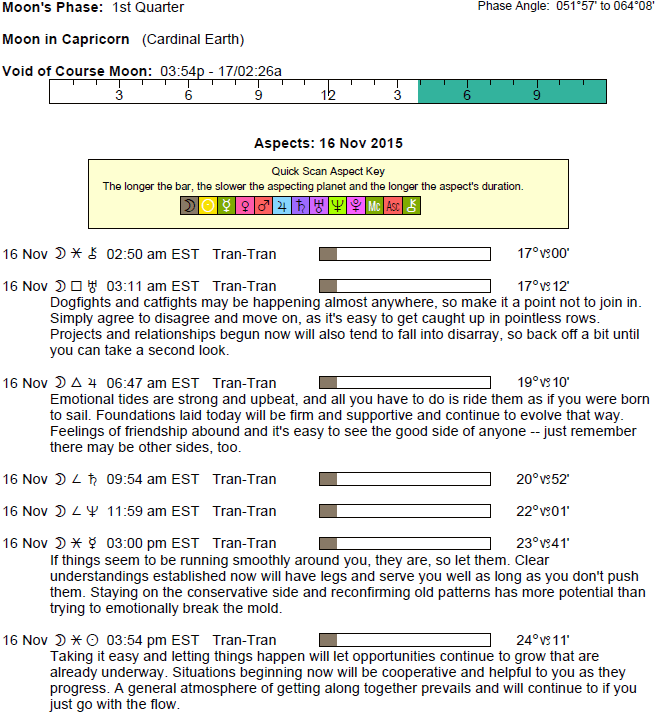 The Moon is in Capricorn all day (until Tuesday, November 17th, at 2:24 AM). 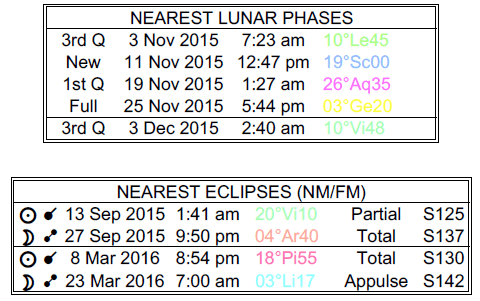 The Moon is void from 3:52 PM forward (until tomorrow at 2:24 AM). 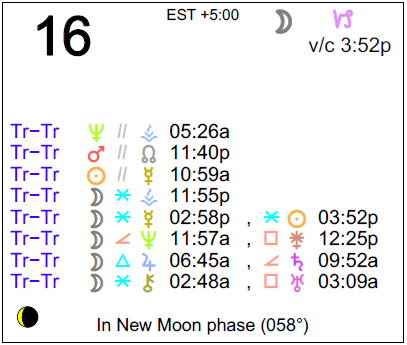 A New Moon occurred on the 11th, and a First Quarter Moon will occur on November 19th. 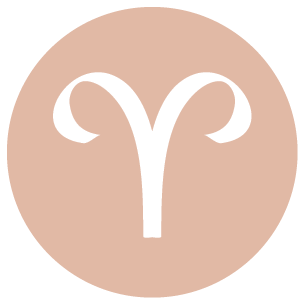 You may be entertaining rather lofty ambitions today, dear Aries, and can be more motivated than usual to do your best. You can readily draw upon especially sharp thinking and reasoning today, although distractions may be a problem. This is a good time to consider ways to bring more warmth or gentleness to your image or your work. Today and tomorrow are strong for ideas and drawing important conclusions. On practical levels, you can accomplish much if you are able to focus. It’s important for you to keep a goal in sight in order to your best today. 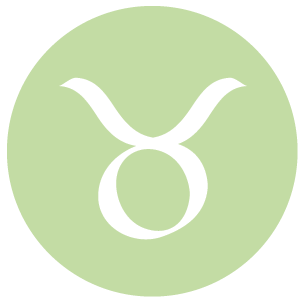 Your mind is inquisitive today, dear Taurus, and you can be especially reasonable and communicative. This is a good day for thinking both in large ways and with concern for details. Your attention span can be powerful but brief, so avoid taking on too many things today. There can be good insight or support coming from a partner or someone important in your life, and putting your heads together can help you to get organized or to make big plans. Changes in your belief system or personal philosophy run much deeper than they appear on the surface of things, and this can be a time for learning things that give your life more meaning. It’s a good day for initiating a conversation that means something to you, or to share your ideas with someone special. 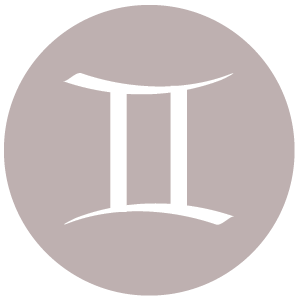 Today and tomorrow are strong for reasoning things out, dear Gemini, and seeing the practicality or logic in recent ideas and plans. As such, patience is important, as well as activities that engage your mind. You can make headway with a financial goal now, or there can be new ideas about a deep relationship. You are adept at identifying and analyzing problem areas, and can be especially good with research and investigation. With the Moon in your solar eighth house and in the background in your solar chart, you have the chance to take a step back, observe, analyze, and make your next move with more forethought. With the Moon in your opposing sign all day again today, dear Cancer, you could be a little moody if you can’t pair up with someone or if you can’t talk through something. Seek out company, and if it’s not available, find a mentally engaging activity to focus on. 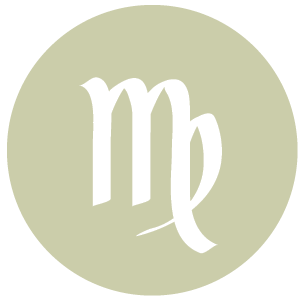 Creative projects can be a good choice now, particularly with the Sun and Mercury moving towards an alignment in your creative, romantic solar fifth house. This is an expressive position, and you need an outlet for expressing your ideas and feelings. It’s also a good time for bringing more rationality and logic to a relationship problem, if it’s needed. 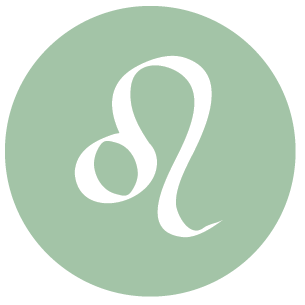 You are unlikely to feel emotionally satisfied if you don’t attend to at least a few items on your to-do list today, dear Leo, but do take it easy and spread things out, as you’ll accomplish more if you don’t pressure yourself too much. This can be a good time for conversations with or about family. Today and tomorrow, you express yourself well although it can be difficult to make everyone happy, as not everything is going to be taken as it’s intended. You might brainstorm or think up ways on your own as to how to better manage and organize your daily life and routines. 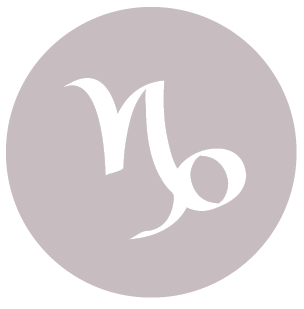 This is a good time for directing emotional energy into a creative pursuit, dear Virgo, if possible, as today can be strong for inventive, unusual, and artistic self-expression. You are especially moderate and tactful with others, although people can be quite sensitive today and tomorrow, so even with special care, there can still be some misunderstandings. Do your best, but don’t worry about pleasing everyone. This is a good time for really seeing the patterns of recent ideas and for ideas coming together successfully. 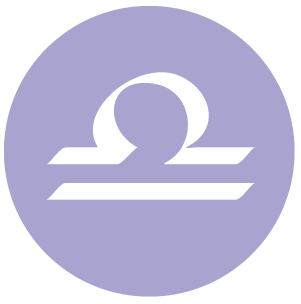 With the Moon in your home and family sector all day, dear Libra, you are likely to want to relax and pull yourself out of the challenge just for now, but you could be drawn to talk about or work on a business idea. Today and tomorrow, there is likely to be a strong tendency for people to communicate, but not always in a way that completely represents how they feel. This could be a good time for your famous tact. It can be a strong time for better organizing your finances, or making sense out of a family matter. 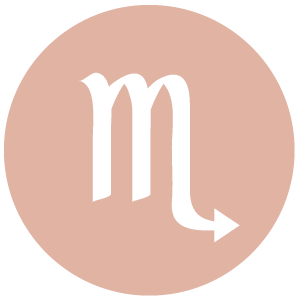 A restless mind today can lead you to some interesting ideas and discoveries, dear Scorpio. It’s a good time to talk about yourself and your plans, or for sharing your ideas. There is general support for what you’re doing, although there can be some communication mishaps to deal with today and early tomorrow. Find something absorbing to throw yourself into, but expect a few distractions and stay flexible now. There can be good ideas related to health or work methods emerging now. This should be a rather emotionally content day, dear Sagittarius. You’re in need of some stability and a steady pace right now, and you’re likely to find it. This is a good time for conversations about the past or for drawing upon past ideas in order to improve your life in the present. There could be a chance to tap into talents that have been ignored or pushed to the side. Ideas emerging today and tomorrow shouldn’t be ignored, even if not everyone is seeing their value quite yet. This may be particularly true of ideas about making a better living or dealing with elements from the past that have yet to resolve themselves. 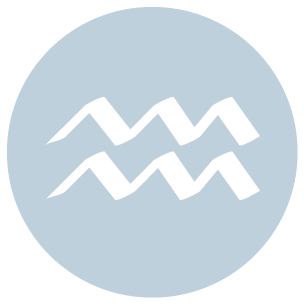 With the Moon in your sign all day, dear Capricorn, feelings tend to be more urgent and strongly felt. 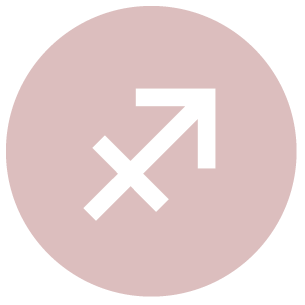 Even so, the Moon reaches out to rational Mercury and the Sun, and this can help balance reason and intuition so that you can draw upon both in good measure. There can be a nice release of tension through conversations with friends, or involvement with friends can bring you down to earth. Problems with others that might surface today and tomorrow can be resolved relatively quickly, and it can be empowering to put personal differences behind you. There can be a greater need than usual for personal, private time to yourself today, dear Aquarius. The Moon will enter your sign early tomorrow, and you’ll feel more sociable and visible. For now, you’re quite inclined to nurture your insides or inner world. Try your best to find alone time, and time to think, meditate, and relax. While you are inclined to look within for answers now, it can be a good time to converse or at least think about life direction matters, business, or career. Today and tomorrow are strong for ideas about any of these things, for work, and for communications, even if there is a stronger need for tact. You may be sought after for your advice or wisdom. 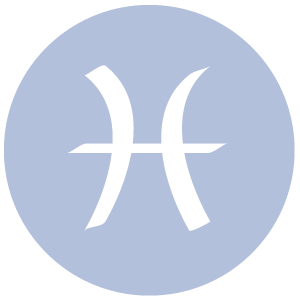 Today and the next few days, dear Pisces, you’re disinclined to overly competitive or demanding situations. Today, you’re seeking out like-minded people, and in the next couple of days, looking for ways to escape the daily grind. You need this time out, so if you can manage it, do so. Even so, today and tomorrow are strong for the generation of ideas, long-term plans, and strategies, and while you can certainly do this on your own, you might also benefit from others’ input or ideas in order to jumpstart your own thinking. 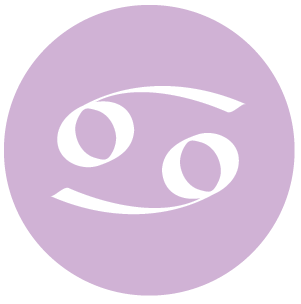 If Your Birthday is November 16th, If Today is Your Birthday full horoscope here. We are more emotionally present and involved. We more easily hone in on problem areas and want to fix them. Synchronicity is a feature of our daily life right now. Tune in and enjoy the spiritual signposts. There may be sudden, minor changes to plans, schedules. There can be rebelliousness and tension. Aim to be open to possibilities, and avoid making permanent decisions. We want to do good and to honor our inner code. We don’t sweat the small stuff right now. We are generous with our energy, time, and money. A great time to take up new feel-good opportunities. Show your confidence and optimism and reap the rewards. We can be motivated to honor our inner code. We don’t sweat the small stuff right now. We are generous with our energy, time, and money. A great time to take up new feel-good opportunities. Show your confidence and optimism and reap the rewards. You have difficulty curbing your desires in relationships. You can be manipulative in your quest to have your desires fulfilled, particularly sexual and financial desires. You need to learn moderation. Sabian Symbol: A dark archway and ten logs at the bottom. Sabian Symbol: Having an urgent task to complete, a man doesn’t look to any Distractions. Cnj 09°Li09 DIADEM To sacrifice oneself. Sun 03° Taurus 56' 57"
Moon 05° Capricorn 54' 34"
Mercury 09° Aries 37' 26"
Venus 04° Aries 32' 17"
Mars 15° Gemini 53' 36"